Lake Wales City Hall is located at 201 West Central Avenue, Lake Wales, FL 33853; phone: 863-678-4180. Photo: Casa de Josephina, ca. 1923, U.S. Route 27, Lake Wales, FL. Listed on the National Register of Historic Places in 1975. Photographed by User:Ebyabe (own work), 2010, [cc-by-3.0 (creativecommons.org/licenses/by/3.0)], via Wikimedia Commons, accessed January, 2015. Lake Wales developed relatively late in the recorded history of Florida. Lying in the central highlands region of the state, the area around Lake Wales experienced little development prior to the turn of the twentieth century. There is no recorded archaeological evidence to suggest that the area was widely inhabited by prehistoric or historic Indian tribes. The lack of river access to the region from either coast also prevented exploration and settlement of the area during the Spanish and British colonial periods. The Second Seminole War (1835-1842) sparked the first concerted development of the southern interior of the state. Forts and military roads were constructed to provide communication in the various theaters of operation. Polk County was established in 1861 out of parts of Hillsborough and Brevard Counties. In 1867 Bartow, fifteen miles to the west of the present Lake Wales, was made the county seat. The area where Lake Wales is located was first surveyed by Colonel J. W. Childs for the U.S. government in 1879. Childs named a large lake for S. I. Wailes, an attorney and State Agent for Florida in Washington who had accompanied him during the survey. Throughout the remainder of the nineteenth century, however, only sporadic settlement, spurred mostly by the cattle and expanding citrus industries, occurred along the Highlands Ridge. Other than Bartow, the area around Lake Wailes remained largely a wilderness until the Sessom Investment Company took an interest in exploiting its abundant pine forests. Following a nationwide trend toward enlightened town planning, the company employed a professional civil engineer, A. C. Nydegger of Winter Haven, to survey and plat its acreage. Nydegger's plan called for the establishment of a central business area west of the tracks of the newly arrived Atlantic Coast Line Railroad and residential lots around the scenic lakes. Taking into account the natural features of the land, Nydegger introduced diagonal and curvilinear drives that produced scenic vistas for choice residential building sites. Nydegger also surveyed and platted the town of Sebring, some thirty miles south of the Lake Wales location. The event that proved crucial to the early development of Lake Wales was the extension of the Atlantic Coast Line Railroad from Haines City to Lake Wales in June 1911. The railroad ended the relative isolation of the community, which previously could be reached only by sand trails. It provided access to the community for prospective settlers and an avenue to northern markets for the products of the naval stores and citrus industries. In addition, the arrival of the railroad bolstered the confidence of the members of the Lake Wales Company, who subsequently proceeded to build a community infrastructure. Land sales were enthusiastically promoted. The first and most prominent of Lake Wales' promoters was J. Walker Pope, a native of Minneapolis, Minnesota, who from his Winter Haven office began selling real estate as an agent for the Lake Wales Land Company in 1911. His promotional tracts emphasized the natural beauty of the area. Besides a turpentine still, the town's structures in its first year included an ice plant, a general store, a small railroad depot, and a hotel, which provided accommodations for arriving settlers and construction workers. Plans were being drafted by year's end for a waterworks. The concession for the water system and an electric plant was assumed by E. G. Stuart. A fire department was organized in 1914, the same year the town got its first telephone exchange. A school, churches, bank, post office, drug store, commercial buildings, and many residences, numbering more than eighty structures in all, were either completed or under construction in 1915. A second railroad, the Seaboard Air Line, began construction of a line through the city. The first train from the second line, which ran east from Tampa, entered the town on April 5, 1915. The initial runs of a local newspaper were printed in Bartow and expressed by train to Lake Wales. On March 16, 1916 the first issue of a locally printed paper, the Lake Wales Highlander, began circulating. It claimed that Lake Wales had a population of 300, which is evidence of the rapid growth the community experienced in its early years. E. G. Stuart, G. V. Tillman, C. L. Johnson, and B. K. Bullard, all of whom were involved in both the Sessoms Investment Company and the Lake Wales Land Company, were the principal directors of Lake Wales' development in that incipient period of growth. The first bank in the village was established by T. J. Parker in the small general store he owned and managed. In 1915, as the village began to assume larger proportions, Stuart and an associate, T. J. Wetmore, obtained a state charter for a second bank. Tillman, Johnson, and Bullard joined them as directors of the new institution, which within six months purchased Parker's banking interests. In addition to serving as president of the bank, Stuart owned the power and ice plants; Johnson played a significant role in the organization and management of local fruit growing associations; Bullard operated a large general department store, established an insurance agency, served in the state legislature, and remained actively engaged in the naval stores industry; and Tillman managed the affairs of the land company itself. All built handsome residences in the city they had founded. In addition to its beauty, Lake Wales offered soils and a climate particularly well suited for citrus production. Citrus, long a vital economic base for the older communities in Polk County, soon supplanted naval stores as Lake Wales' most valuable industry. The first organization of local growers in the Lake Wales area was the Waverly Growers Cooperative, founded in 1914. A second, the Lake Wales Citrus Growers Association, was formed by a number of locally prominent independent producers in 1918. They joined an increasing number of similar organizations, as the Lake Wales area became part of a regional citrus boom. By the end of the decade, Polk County was the largest citrus producing county in the state, and the prospect of obtaining cheap land for the cultivation of citrus became a major draw in attracting settlers to the relatively undeveloped Highlands Ridge area. The commercial and residential buildings constructed by the early residents of Lake Wales exude a sense of permanence and solidity that was not common to the communities of Florida which developed during the nineteenth century. 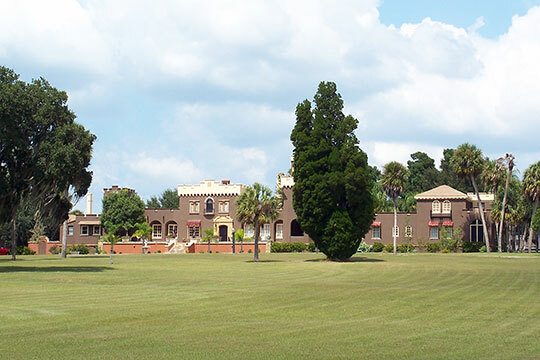 The buildings of Lake Wales reflect the founders' confidence in the village's future. The Florida towns that developed in the earlier century grew organically, for the most part. That is, they began as outposts in the wilderness, small settlements that were usually placed along the coast or a natural artery of transportation. Their first residences and commercial buildings were wood frame. Brick did not come into widespread use until late in the century, after disastrous fires had leveled great parts of the earlier towns. Lake Wales did not have to endure that experience. The presence of the railroad, which could be used to import building materials, the by then common use of brick, and the easy availability of cut lumber and twentieth century building materials allowed the early settlers of Lake Wales to erect substantial buildings from the start. Lake Wales remained an unincorporated village until May 28, 1917, when it was incorporated as a town. A mayor and five councilmen were elected in June; B.K. Bullard served as president of the Town Council, and C.L. Johnson was the first tax assessor. Among the early acts of the council was an ordinance defining the town's fire limits, which provided for regulation of the use of building materials and ultimately led to the replacement of all wood frame buildings with brick and steel structures in the commercial sector. On the eve of America's entry into World War I, Lake Wales was poised to begin its physical transformation from a fledgling rural community to a modern small town. The war, however, halted immediate progress in construction as the people of Lake Wales, like the rest of the country, turned their energies to the war effort. When development did resume after the war's end, it was spectacular. Expansion in Lake Wales, especially in the commercial area, followed rapidly on the heels of Armistice Day. Within the following two years, eight substantial brick commercial block buildings were added to the downtown area where only three had existed before. The principal area of commercial development was concentrated along Railroad Avenue (now Scenic Highway), between Orange Avenue on the north and Central Avenue on the south. Some commercial development had begun to spread westward along Park Avenue. A large garage was constructed on Railroad Avenue, between Stuart and Central Avenues. It served as a showroom and repair shop for automobiles, which by that time had already become a ubiquitous feature of American life. A motion picture theater, another innovation of twentieth century American society, was located west of the garage. The post office stood on the north side of Stuart Avenue. Other commercial buildings included a drug store, grocery and mercantile stores, a shoe shop, feed store, and warehouse. By 1920, Lake Wales had experienced growth that in an earlier decade might have seemed phenomenal, rising from wilderness to a small urban community in the short span of seven years. It is doubtful, however, that even in their wildest dreams the founders and promoters of Lake Wales and other Florida communities would have envisioned the experience of the next five years. During the 1920s, real estate speculation became the prime force behind what became known as the Great Florida Land Boom. Entranced by a flood of promotional literature expounding upon the beauty of Florida, freed by the increased mobility which the automobile afforded, and inspired by the prospect of making an easy fortune through land speculation, visitors from all over the country descended upon the state in unprecedented numbers. It is difficult to exaggerate the speculative proportions of the 1920s Boom in Florida real estate. Miami and Palm Beach are generally regarded as the areas of most intense activity, but few communities in the central and southern parts of the state failed to get caught up in the feverish rush for property. Twenty thousand people were thought to be arriving daily in the state in December 1924. That fall, the Florida Legislature issued an open invitation to wealthy investors with approval of a constitutional amendment prohibiting either an income or inheritance tax. The resulting influx of capital further accelerated an already well developed surge of land purchasing. Lake Wales shared in the experience, to the extent that the city might be regarded as a product of the Boom. From a base of 795 in 1920, the population jumped in five years to an official count of 2,747, an increase of 245 percent, which one contemporary writer said was the greatest gain made during that period by any Florida city or town. The Chamber of Commerce estimated the population that year in fact reached 4,000. The number of telephones in use rose from 117 to 1032 in that same period; power connections from 205 to 1,200; and water connections from 191 to 842. Together such figures provide a reliable index to the enormous building activity that occurred. The town did not begin to compile building permits until 1922, when 49 permits for business, garages, and homes were issued. In 1925 and 1926, 248 and 283 such permits were granted. The valuation of such activity rose from $64,389 in 1922 to $1,278,800 in 1926. The fire insurance maps produced for Lake Wales in 1924 indicate that growth was widely dispersed. Commercial infill westward along Park Avenue continued. As revealed by the building statistics, the growth was mainly in residential structures. The lots around Crystal Lake were about seventy-five percent filled by 1924. The blocks bounded by Bullard and Polk Avenues, the pond, and railroad were occupied to approximately the same extent. The northwest quadrant of the town, particularly 2nd, 3rd, and 4th Streets between Washington and North Avenues, was included in the 1924 map, which indicates heavy lot coverage in that area. Many of those buildings, however, may have been present before 1920. Between 1924 and 1928 growth was characterized by additional infill of the already developed areas around the lakes. Major subdivisions were added in the southeast sector of the town, south of Lake Wailes and along Hesperides Highway. The lumber mill complex operated by the W.C. Sherman Company in the northwest corner of the town was greatly expanded. Within the commercial area, the Rhodesbilt Arcade, the most distinctive building in the downtown area, was completed in two stages between 1924 and 1926. The Dixie Walesbilt Hotel, a ten-story structure, towered over the town from its location between Park and Stuart Avenues on 1st Street. The 120-room hotel, which was completed in 1926, reflected the town's optimism about the tourist industry. The area around Lake Wales also prospered, as evidenced by the development of the neighboring communities of Mountain Lake, Highland Park, Ridge Manor, and Babson Park. The continuing development in 1927 of Mountain Lake, construction of Lake Wales' new City Hall and high school, the latter designed by noted Tampa architect M. Leo Elliott, and the continuing prosperity of the citrus industry may have insulated Lake Wales to some extent against the more dramatic effects of the Boom's collapse. The speculative bubble began to deflate in August 1925 when the overloaded Florida railroads announced an embargo on freight shipment to South Florida. Rail lines and ports in the Miami and West Palm Beach area had become clogged with incoming building materials. Bankers and businessmen throughout the nation had begun to complain about transfers of money to Florida. Newspapers suggested fraud in land sales. Florida's governor and a score of representatives from the state's press held a "Truth About Florida" meeting in New York in an effort to counter disparaging publicity. In spite of their efforts, Florida's image remained little changed. Property values that in some locations had soared to exaggerated levels during the Boom's peak fell precipitously, bringing over-extended speculators down with them. Conditions worsened in 1926 and construction activity in most parts of the state shut down in 1927. The Great Depression descended upon Florida, three years in advance of the rest of the country. The population of Lake Wales had grown to 5,000 by 1928, but the Depression brought an end to the town's expansion. Although there was some infrastructural residential growth in the late 1930s, as the economy began to recover and Federal Housing Administration programs permitted easier access to credit for prospective home owners, Lake Wales, like most Florida cities, did not regain its developmental momentum until the end of World War II. The physical development of Florida cities, which came to a standstill during World War II, resumed with renewed vigor in the late 1940s as the state entered another period of halcyon growth. Lake Wales was spared the devastating effects of change wrought by the expansion of Florida's highway systems during the 1950s and 1960s. The two major highways, north-south U.S. 27, and east-west S.R. 60, which cross one another within the city, skirt both its downtown business district and the residential areas that contain the city's highest concentration of historic buildings. The interstate system and accompanying strip development bypassed the city. As a result, Lake Wales possesses much of its historical infrastructure. Buildings that complemented one another in style, materials, color, and location generally remain. The scale of the city has been preserved over time, in spite of the rapid growth of Central Florida. Stephen Olausen, Barbara Mattick, Historic Sites Specialist, Florida Bureau of Historic Preservation, Lake Wales Multiple Property Listing, Polk County, FL, nomination document, 1990, National Park Service, National Register of Historic Places, Washington, D.C.